Topdressing lawn can be a pretty broad and general term so here is our definition. It is a method of adding compost or other materials as improvements to the soil, or for leveling existing lawns. This short module will introduce do-it-yourselfers to lawn top dressing and some of the benefits it can provide. Topdressing lawn improvements can be a layer of compost, mulch, loam, peat, or different combinations of all these things. Whatever you use, it should be compatible with your existing soil needs. Did you ever wonder how some people have that perfectly flat lawn? One of the most important reasons for top dressing a lawn, is to improve the existing soil. This benefits the lawn by feeding the soil with essential nutrients and microbes to make it thrive. Combining top dressing with core aeration, or dethatching is an excellent way to do this. It can change the existing soil composition in a few short years. With topdressing lawn, the results can take a few seasons, so be patient. Regular topdressing is also a great way of improving drainage in clay soils, or improving moisture retention in sandy soils. Top dressing lawns can fill in depressions, sink holes, and level out imperfections. Making it a great way to achieve that "perfect" level lawn. Installing irrigation, lighting, or other features can leave behind damaged lawn that may benefit from topdressing. Patience is the key to successfully topdressing a lawn. It usually takes a few seasons, and multiple layers to achieve the best results. Managing thatch is another great use of top dressing a lawn. Studies have shown that the microbes help to break down the layer of thatch in your lawn. These microbes exist in in a good organic topdressing, and healthy aeration cores. The result is soluble nutrients that can be used by the root systems. Some consider mulching grass clippings a form of topdressing. The clippings break down over time, feeding Nitrogen, Phosphorous and Potassium back to the soil. Topdressing lawns can be done for a few reasons. 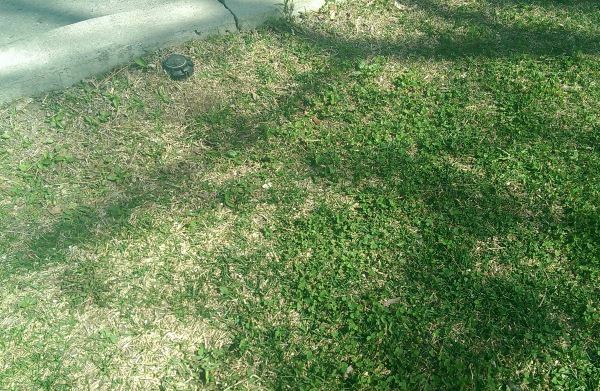 This lawn is doing poorly and the soil has settled from the curb height. Learn more about topdressing here. This can reduce the amount of fertilizer by as much as 30%. Compost and other topdressings provide many nutrients that stimulate new shoot growth which leads to a healthier and thicker lawn. These lawns will resist weeds, drought, disease, pests, and winter stress. As well, these lawns will require less chemical treatments and fertilizers. One of the best times to apply topdressing for soil improvement was mentioned previously. (Just after core aeration.) If you have very poor soil or heavy clay, the cores have no benefit to the lawn. They can be left, or raked up and removed. The new topdressing material will fall into the holes replacing the bad soil with the good. Another great time to topdress is after dethatching. If you have a heavy layer of thatch in your lawn, you should dethatch your lawn before applying the topdressing. Topdressing helps control thatch, but thatch levels have to be manageable to begin with. How thick should the topdressing be? Although grass will usually grow through a couple of inches of soil, it's important not to bury your lawn too deeply. I have seen grass grow through up to 6 inches of soil. Burying the grass blade will also prevent photosynthesis. The more soil you add, the less grass will grow through. Therefore, it is recommended to add topdressings to a depth of ¼ inch to ½ inch at a time. Be patient, and build in layers. Mow the lawn to the lowest recommended height for your variety, and bag the clippings before applying topdressing. Many people spread topdressing using a shovel and wheelbarrow. For consistancy, you can use a rake to lightly spread the topdressing more evenly across the lawn. Check with your nursery or garden center on what products they have available for topdressing lawn. They may have more than one option. I also recommended that if you are not sure of your current soil conditions, you should visit your local county extension office with a soil sample. They will be able to tell you what topdressing will best improve your conditions. As I said previously, not all mixtures are compatible. Hopefully, you can now see the value of topdressing? If so, add it to your lawn care and maintenance program.